The City of St. Charles is located 35 miles west of downtown Chicago. Along with Geneva and Batavia to the south, the area is often referred to as the tri-cities and has a reputation as a great place to live, work and play, along with being a shopping, dining and recreational destination. 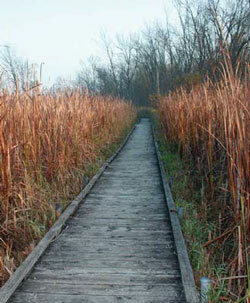 The Fox River Valley on a regional scale is a unique natural, cultural and recreational resource within the Chicago region and beyond. The St. Charles section of the river is particularly scenic, offering many active and passive recreational alternatives. St. Charles has an opportunity to capitalize not only on its own unique attributes, but in coordination with other Fox Valley communities, the region on whole can leverage their resources to improve and prosper. The 3.8 mile section of the Fox River within St. Charles is especially scenic and offers a variety of recreational opportunities due to the 18 acre upstream pool created by the dam and the 7 miles of unobstructed river until the next dam north located in South Elgin. Due to its popularity, the balance of multiple uses within the river can be a challenge at times. The floodplain and floodway extend beyond the banks of the river in some locations and can be a source of periodic flooding and inconvenience. This impacts potential development/redevelopment sites and will require further study and permitting as specific site improvements are considered. There are a number of preserved natural areas along the river through St. Charles including Forest Preserve, Park District, and City owned properties. On the whole, environmental quality is considered to be improving in the area and continues to be the focus of many regulatory and special interest groups, along with the community in general. Water quality is of particular concern within the Fox Valley region. The general perception is that water quality has improved over the past several years, but current high phosphorus levels lead to algal blooms and low dissolved oxygen levels. The Fox River Study Group (FRSG) was formed to study the river relative to wastewater treatment plant discharge and to establish regulations based on water sampling and models. Representatives from local communities, including the City of St. Charles, make up the FRSG and are developing recommendations to improve water quality. The resulting Fox River Implementation Plan (FRIP) will include guidelines to improve water quality in lieu of mandated discharge levels as determined by the IEPA. The St. Charles Dam is a subject of considerable recent study and debate. The dam was originally constructed for a grist mill and served an important function for the community. The dam is owned by the Illinois Department of Natural Resources and currently is considered recreational in use, although for many, it serves a meaningful function in that it maintains the upstream pool, considered a priceless cultural and recreational asset for the community. To others the environmental benefits of complete dam removal including improved water quality, wildlife habitat, and safe passage off set the recreational and cultural benefits of maintaining the dam. Any modification to the dam will be subject to regulatory permitting requirements involving considerable technical study of the hydraulics, water levels, sedimentation, flooding, and navigability of the river. One of the most significant challenges to accomplishing public improvements is property ownership and gaining access to the riverfront. 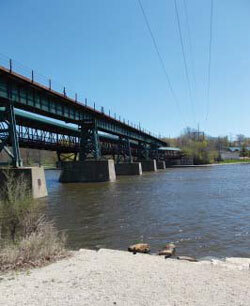 Fortunately, 44 percent of the 3.8 miles of the Fox River within the City of St. Charles is publicly controlled. This provides opportunities for public access to the water, along with opportunities for public uses to be located directly on the river. However, 40 percent of the private property along the river is single family residential, leaving few opportunities for economic development. 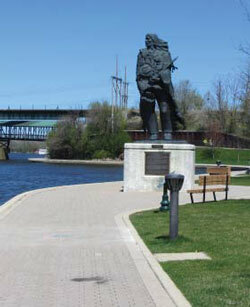 The downtown area is the exception where there are commercial opportunities along the riverfront. The City of St. Charles was founded along the banks of the Fox River and by the mid 1900’s the community became known as a resort town, with tourism being a major component of the City’s economy and identity. Today St. Charles is considered a desirable city in which to raise a family and is renowned for its high quality of life and natural beauty. Although growth has occurred both east and west of the downtown, the river has remained the center of the community and continues to influence its reputation as the Pride of the Fox. Public infrastructure and utilities are considered adequate within the corridor but any significant development would need to consider infrastructure and utility needs. 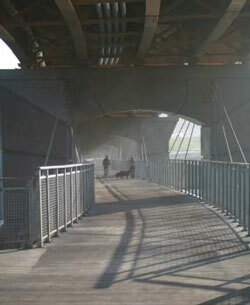 There are utility crossings under the river that also need to be considered with any significant modification project. St. Charles is accessible from major arterial roadways including Illinois Route 64 (Main Street) running east/west, Illinois Route 25 running north/south on the east side of the river, and Illinois Route 31 running north/south on the west side of the river. Kirk Road is the major north/south corridor on the east side of St. Charles and Randall Road is the major north/south corridor on the west side of St. Charles, both are Kane County highways. St. Charles does not have direct access to interstate highways, but three interstates are located in close proximity; I-90 is located 9 miles to the north, I-88 7.5 miles to the south and I-355 11 miles to the east. St. Charles does not have commuter train access but the Geneva Metra station is located 1.5 miles to the south. One of the corridor’s most important assets is the regional trail system including the Fox River Trail (east and west sides of the river) and The Great Western Trail that heads west from downtown. These trail systems connect to an extensive regional trail system that extends throughout the Fox River valley and beyond. There are opportunities to improve the trail system by connecting gaps, especially through downtown along with adding clear signage, support facilities and amenities throughout. 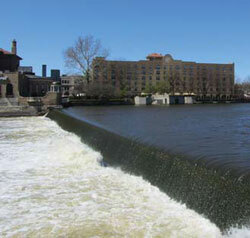 Currently the St Charles dam prohibits water based users from passing through downtown. Dam modification would allow canoeists, kayakers, and other river users to travel the length of St Charles. Portage and safe passage routes would allow less experienced users to navigate the downtown, while improved docking facilities would allow water based visitors to more easily visit downtown. Pedestrian and bicycle circulation is adequate but not especially noteworthy. The corridor would benefit from improved pedestrian crossings, traffic calming, and complete streets initiatives to improve the multi-modal experience within the corridor. Where possible, grade separated crossings either under or over roadways are preferred. The railroad bridge located just north of Main Street is owned by the Union Pacific (UP) railroad and is no longer in service. The Park District, City and Forest Preserve District have approached UP to discuss future control of the bridge and the associated right-of-way. Discussions about purchasing or gaining rights to use the structure for a regional trail connection have been favorable, although funding is not currently available. Parking is important to any viable development, downtown or corridor. 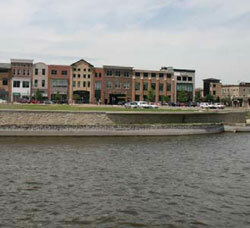 Parking in downtown St. Charles is considered adequate although surface parking lots take up valuable land within the project area, especially along the riverfront. Two parking structures in the downtown provide increased parking per square foot of area and additional parking decks would be a benefit as additional development and programmed uses are added. Shared public and private parking within off -street lots is another way to leverage the limited space available for parking. The City of St. Charles has gateway signage at the City limits along with wayfinding signs throughout the downtown. Other community groups and agencies have signage with various messages throughout the corridor. The community as a whole would benefit from a consistent image and messaging throughout the downtown and corridor.